The might of Hammer took on the very different challenge of SW London Juniors in a double-header this month. 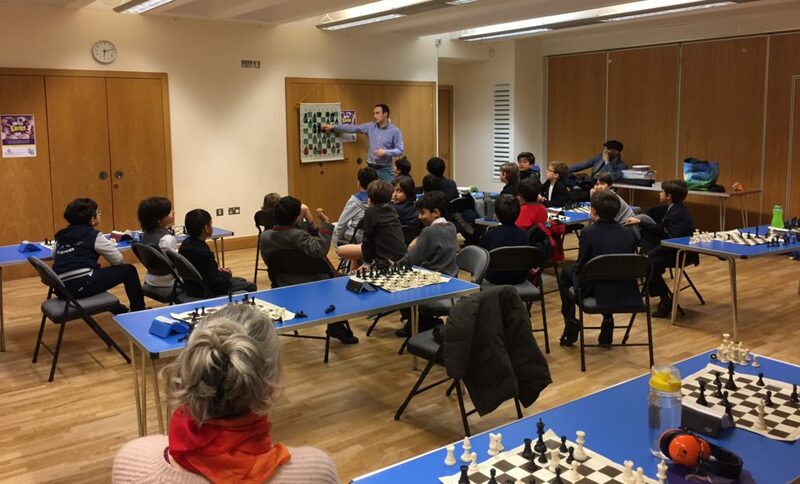 The format of the match agreed was two nights of chess – one at the home of the Juniors, and one at the home of Hammer – Valhalla, as we like to call it. Played over as many boards as possible with each pairing playing each other twice on the night – once as Black, once as White. The time control was 20 minutes to start, plus 5 seconds increment per move. All games will be graded and thus the participants would achieve a Rapidplay grade. Before relaying the events of both nights, I feel I must first comment on the SW London Juniors and our Hammer Club. As for my club, Hammer, I am proud to say that over twenty members rose to the challenge and met their young foes over the board, displaying great grace, patience and a will to win. There are very few clubs where senior chess players would put themselves up for this kind of match. But our club did, and that says a lot about the club culture and commitment to the future that Hammer Chess has embraced over the last two years. Ok, enough of the slaps on the back for all concerned – let us review the actual chess! The first match was held at SW Junior HQ, situated near Earls Court. The date was the 1st March. Thirty-one games of chess were played in total and the big people triumphed 20.5-10.5. The chess was so frenetic I was unable to keep track of my fellow Hammerites as the pieces flew round the boards. One thing about playing children is that they have no fear, they relish the challenge of bringing down an adult, they play at speed, and boy do they love attacking! The top-tip is to remember that defence is something they have yet to learn, so a controlled, aggressive approach is always the right way to approach such games. Unfortunately, this does not always work and Marios on board 1 was facing defeat in a prepared line of the Scotch – indeed, he was objectively lost in every sense. Unfortunately for his young opponent – but fortunately for Marios and us – he missed a back-rank check mate. This was a definite wake-up call and showed that these young people could play; and play very well. This was the only game Marios played – but what a game! I know for a fact that he analysed this line very extensively after the game – he will not be caught again. The double-doughnuts were Robin, Danny and Shaun. Indeed, Robin lost to a young man with the same surname. The new Lee is on the block!! Although the score line seems one-sided, I can assure you it was not! The return leg took place on the 13th March at Valhalla, and Hammer this time had an idea of what we were facing. The feel-good factor from the first encounter meant that we tried to get twenty boards out. Have to say, SW Juniors delivered, whilst Hammer had to default a few boards. The result was a good win for Hammer again, but the SW Juniors played outstandingly well and went down fighting. However, the march of time is relentless and these juniors are increasing their strength at an alarming rate. I am not sure in a year’s time Hammer will triumph again. I hope all who took part enjoyed the evening – I know I certainly did. My funniest memory of the evening was the sight of Jay, Ken and myself sitting on the blue kiddy chairs to play our games! I had enough sets, boards and tables, but did not think we would ever fall short on the chair count! Please note for future reference: we only have about 32 chairs! Once again, thank you to the two Tony’s, the SW Juniors, and the Hammer Heroes – we will repeat next year! Only managed to attend the second leg but it was a thoroughly enjoyable evening. Many thanks to John and Tony(s) for pulling the match together. Thanks for the match, it was great and well organised! I now remembered that I forgot to add my result to the scoresheet! I think Tony did on his side but I’m not sure! Looking forward to the next! A good fun night, well done all!